For the past week I have been trying to get in the groove of the work culture at BotVFX. Every day, I expect the monotony of familiarity to seep in, and every day I’m left a little more amazed. Here’s one of the reasons why. 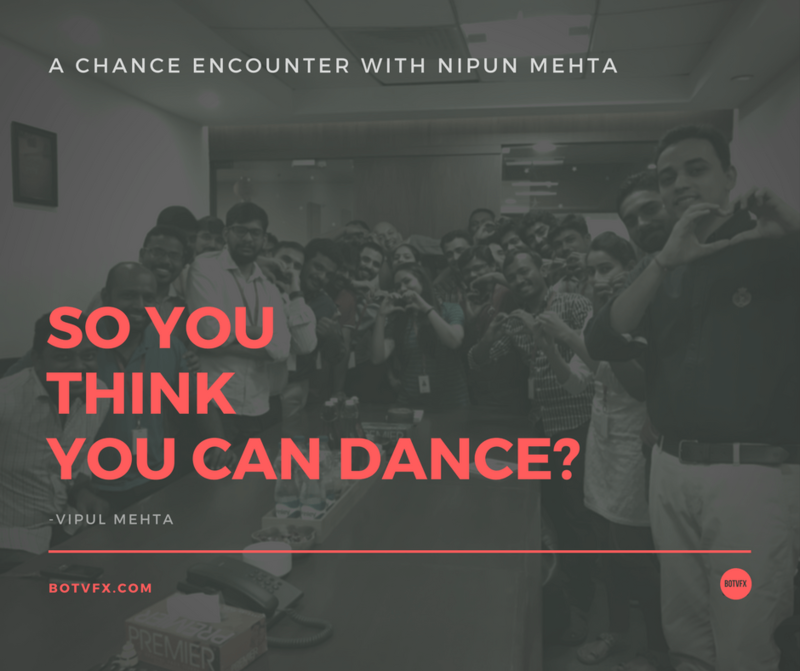 At about 11 a.m. we get a brief about the speaker, Mr. Nipun Mehta – who is also Hitesh aka SuperBot’s friend. I quickly glance through his profile, and I’m instantly in awe of him. You’d be too if you found out that you were going to meet someone who’s received the Dalai Lama’s Unsung Hero of Compassion award. He’s also been on President Barack Obama’s council to reduce Poverty and Inequality. I’ll admit, I was a fanboy already. I head over to the conference room, where I instantly realize I’m not the only one who got the brief. Dressed in plain clothes paired with ordinary ‘chappals’ was a young yet not so young gentleman sitting across the room. Preconceived notions had me paint a mental picture of this guy dressed to the nines – tailor-made 3-piece suit, matching tie, Italian leather shoes, the complete jazz. Oh and of course, the American accent. Cut to reality. I’m looking at this man, and am thrown fully off my train of thought. Introductions are made. Nipun takes a look at all the Hollywood movie posters hanging on the walls. He stops at Invictus and stares at it intently. He asks us if we did any work on this film (yes, we did). Nipun is impressed. He then goes on to talk about how the film, based on Nelson Mandela and François Pienaar, shows a nation brought together in times of intense racial tension by a sport. And how potentially vicious issues were easily resolved due to Mandela’s humility. Nipun is reminded of his own personal experience – he was inspired by none other than Gandhiji to leave behind all his belongings in the USA and start a pilgrimage march in Gujarat. One anecdote led to another, and I just marveled at the way his words managed to strike the right chords, making the brain ponder on thoughts often looked over, giving a whole new perspective on things. When Nipun left all his comforts in Sillicon Valley, USA, he knew that his true calling was volunteering. But, if it really was as easy, we’d have made Florence Nightingales out of everyone. Leaving everything actually meant EVERYTHING. No cheat codes, no hacks, NOTHING. He recalls one incident where he was offered dinner by an elderly lady. Her husband asked from where he had started. Nipun replied, “Ahmadabad”. The old man repeated “Oh, Memdavad”. Nipun corrected him “No, no! Ahmadabad, dada!”. The old man again said, “Haan, Memdavad” to which Nipun corrected him again. This correction-tennis went on for a few minutes. Convinced that the old man was hard of hearing, Nipun finally said, “Ahmadabad, dada, Ahmadabad! 127km from here, AHMADABAD!”. The old man softly said, “You have not truly left behind everything, because in your head you are still keeping track how much distance you have covered”. The depth of these words hit Nipun like a rock hurtling towards earth like the asteroid in Armageddon. What happened next was what we called “An Epiphany”. He realized that he was going to have to leave a lot more than just money and material comforts to really get a deeper understanding of life. He then correlated this anecdote with Giving & Receiving vs Dancing. Giving and Receiving are transactional acts. There is an exchange between 2 people. You give something only because you want to receive something. Dancing on the other hand is not transactional and is best enjoyed when you don’t care who is looking, who is judging, without anyone keeping a minute to minute track of your steps, letting yourself loose – Basically, you do it for the pure love of it and nothing else. In a case study of an organization, employees were all placed at the same level and could work their way to the top. They were also grouped under 3 categories. Givers – Generous people who place the needs of others above their own. The ones who only give and give and give – a fountain of generosity. Takers – Selfish people whose number one (and perhaps only) priority is their own self. Life is an all-you-can-eat buffet, and these folks are here for it. Matchers – Those who give as much as they take or vice versa. They know that you can only rightfully take stuff when you’ve given stuff in exchange in the first place. At the start of the study, Takers were at the top, Matchers in the middle and Givers at the bottom. However towards the end of the study there were a quite a few Givers at the top and Takers at the bottom. The study proved that even Givers could make it to the top (defying the notion that Givers are the literal and figurative Losers). Similarly, a Taker could end up at the bottom. Matchers on the other hand saw that giving would transform into receiving more hence they would adapt themselves to be Givers. Hence a total win-win for the organization. 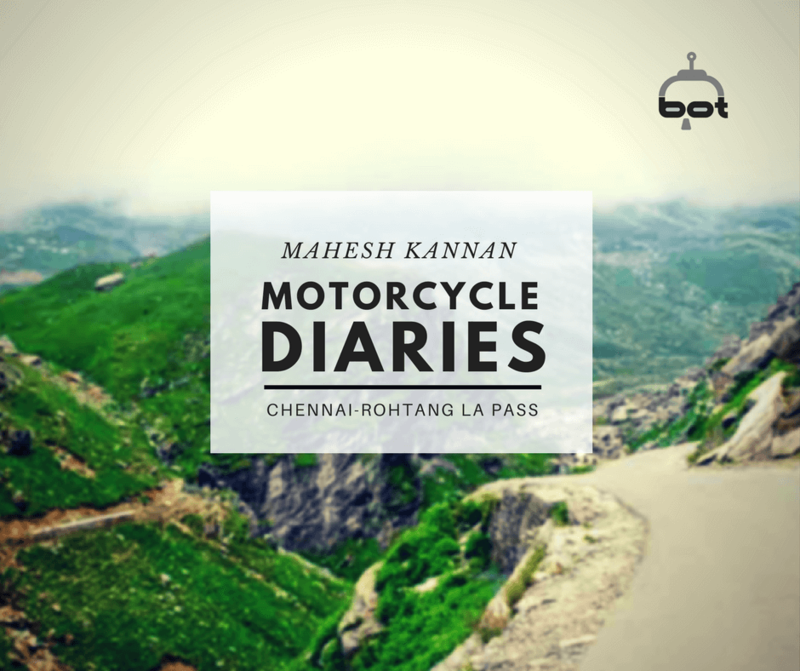 When on topic of his pilgrimage, Nipun recalls the many days he spent hungry and thirsty. Earning needn’t necessarily mean asking for money. Once, he asked an elderly person if he could assist the person in carrying his haystack back for nothing. The old man thought Nipun must be asking money to do the deed. 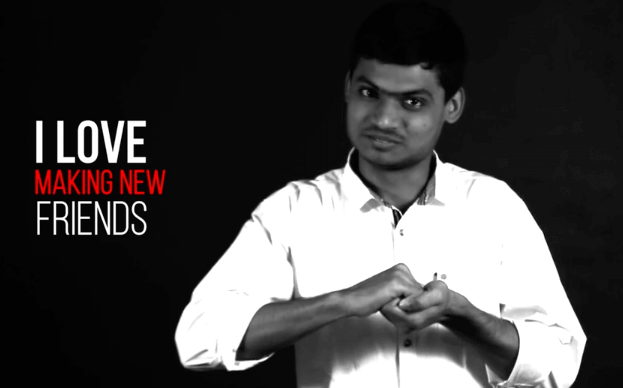 However, Nipun clarified that there were no strings attached, and that he would really do it for free. The old mad, though bewildered, agreed. When the old man and Nipun (holding the haystack on his head) came back to the village everyone wondered who was this new guy helping out this old man? The old man who was now having a 56-inch proud chest replied to all, “Someone was willing to help me without any reason – Godsent in the truest sense!”. That day Nipun may not have earned anything monetary but he earned goodwill – forming a relationship with the old man. There’s no currency for that sort of stuff. Nipun’s anecdote brings out the true meaning of life. When we are born we are born with nothing. When we die, we die with nothing. But, it’s the period in-between that matters and determines what we leave behind. It really is about the legacy you leave behind for generations to come, for strangers everywhere. You don’t have to reach the saintly level of Nelson Mandela. You can be a hero in your own little pond. The beauty is in taking the first step, and then repeating that over and over. Some people choose to do nothing, and are, thus, ultimately forgotten. Don’t be one of those “some people”. There are already far too many of those. There is this lazy, mistaken notion that you earn virtue just by signed a cheque to some NGO. If wishes were horses, am I right? Once in a company there was a soft drink vending machine. One day an employee decided that he would treat the next person to a free can of Coke. He put up a note on the machine saying that ‘Enjoy your drink, its on me’. He did this everyday. Soon this became an office sensation. Everyone in office was curious who was this mystery Coke can gifter. When the mystery unraveled and the true perpetrator brought to question, he simply said that he just wanted to gift happiness… to anyone. The joy of receiving a gift is surpassed only by the joy of giving, because the happiness is actually doubled once it serves its purpose. Key and Peele – Can you be too nice at the office? Vinoba Bhave was one such person who believed that ‘Helping Helps Helpers’. People adopted him as their son and gave 1/6th of their land to him. He in turn donated all the land received to the homeless, poor and landless. He helped more than 1000 villages by way of such help and countless lives were benefited solely because of him. Nipun then went on to explain a corollary that read something to the effect of, “Only Hurt People Hurt Others”, which actually makes a lot of sense. Think about it. Nobody is born a villain. Nor does anybody intentionally want to hurt anyone. A pertinent question we should be asking ourselves is that should we restrict kindness only to selected people? No. Take the 21 day kindness challenge and see an intrinsic difference! Everyday make it a priority to fulfill one random act of kindness. Kindness can be in any form. Take someone out, write a note to someone, bring a cupcake, teach a topic – Anything! And so Nipun left us with a barn full of fodder for the mind. True to his word he made sure none of us left empty-handed as he ensured he ‘gave’ a powerful hug to every person in the room. 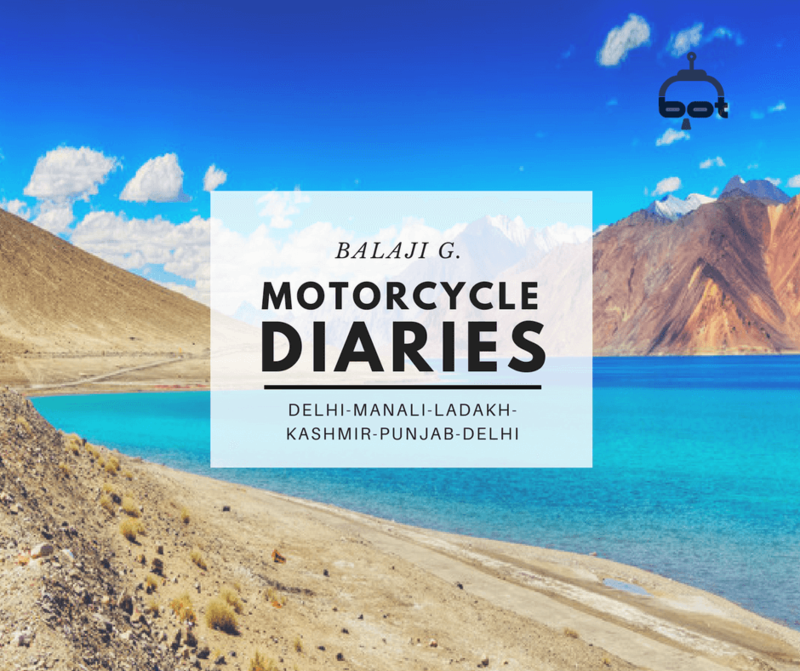 November 29, 2016 February 4, 2019 |BY Praveen GYMotorcycle Diaries: Mahesh’s Kaleidoscopic Bike Trip From Chennai to Manali!